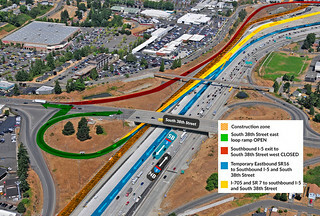 TACOMA – A new stage of construction on the I-5/SR 16 Realignment and Connections HOV project this spring will bring temporary ramp closures and traffic switches for Tacoma commuters. 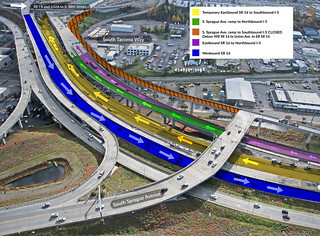 As early as April 6, Washington State Department of Transportation contractor Skanska will close the South Sprague Avenue ramp to southbound Interstate 5 through spring. Crews will also close the eastbound ramp to South 38th Street for approximately one week. The closures allow crews to rebuild the southbound collector/distributor lane that runs between eastbound State Route 16 and southbound I-5, and the South 38th Street ramps. Once the eastbound South 38th Street ramp reopens, southbound I-5 and eastbound SR 16 drivers exiting to South 38th Street may turn right or left at the top of the ramp. Traffic will be controlled by a temporary traffic signal. This gives drivers full access to South 38th Street while crews rebuild the westbound ramp. The South 38th Street on-ramp to southbound I-5 will remain open during construction.